Homepage. 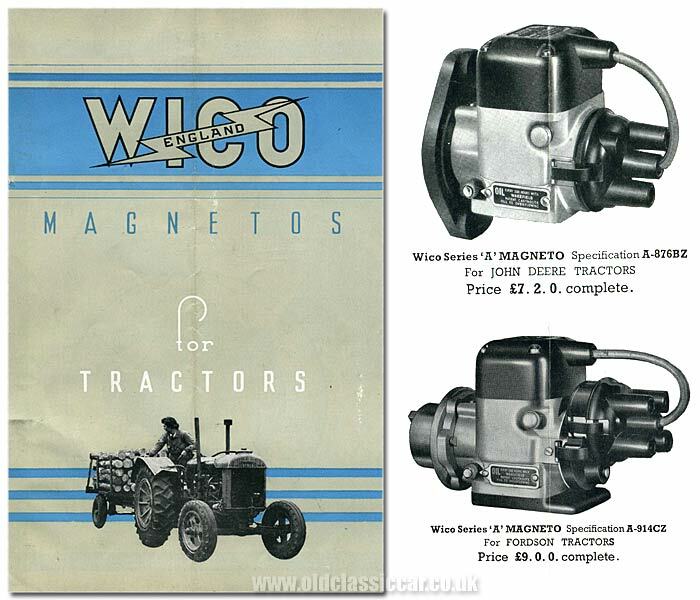 This page: A leaflet from the 1930s describing the range of Wico magnetos available to tractor operators. The small leaflet featured below describes the various magenetos that the Wico-Pacy Sales Corporation Ltd could supply to tractor operators during the 1930s. The cover shows a young lady behind the wheel of a Fordson Model N, a trailer full of logs attached to the rear. The Wico Series A magneto. 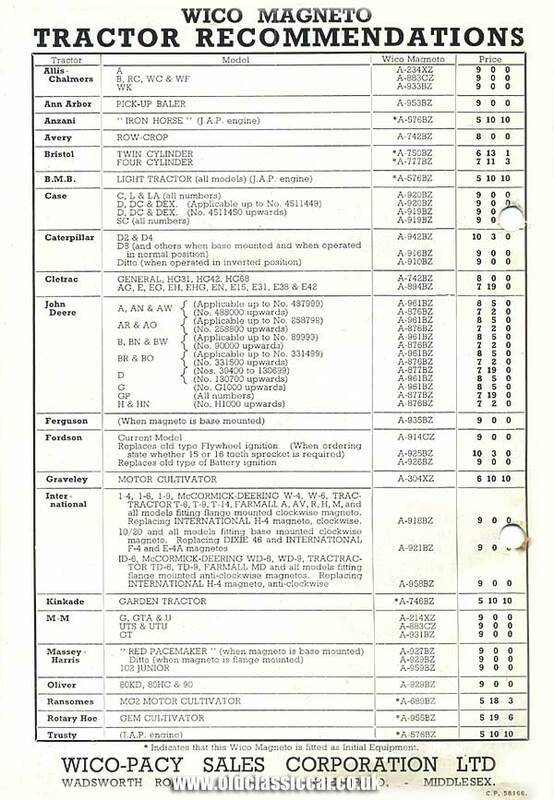 Within this brief leaflet are details of the Series A range of tractor magnetos, with illustrations of the A-876BZ magneto (for John Deere tractors) and the A-914CZ (to suit the Fordson tractor). The Wico Series "A" magneto which can be supplied as a replacement for most well-known makes of tractors, is modern in every detail, basically sound from an engineering standpoint and provideds a definitely improved source of ignition in keeping with the latest trend in engine design. It is rugged, but light in weight, die castings being used wherever practical, and combines the well known Wico principle of Die-Cast Magnet Rotor with laminations and magnets cast integrally. Provision is provided for easy adjustment of the breaker points by means of an eccentric screw. The magneto is fitted with an impulse coupling which is designed to give a spark of high density for starting. This impulse coupling, which is built into the magneto, provides a retarded spark for starting, which automatically advances as the engine gains speed, returning to the retarded position when the engine stops. Wico replacement magnetos for tractors are in every case specially designed and arranged for instant fitting to the tractor and no alterations to the engine are required, so that in the event of a breakdown of the standard magneto, your nearest Wico agent can supply and fit the replacement Wico magneto in the quickest possible time. Information regarding local Wico agents could be obtained either by telephoning Perivale 2070 - 2486, or by sending a telegram to Wicomagsco. The rear cover lists many of the popular 1930s tractors, along with details of the corresponding Wico magneto and the price. I've scanned this list in case anyone who owns a tractor fitted with a Wico magneto lands on this page, and needs further information (click here to view the list). Allis-Chalmers A, B, RC, WC, WF, WK. Anzani "Iron Horse" (JAP engine). BMB Light Tractor (all models) (JAP). Case C, L, LA, D, DC, DEX, SC. Cletrac General, HG31, HG42, HG68, AG, E, EG, EH, EHG, EN, E15, E31, E38, E42. John Deere A, AN, AW, AR, AO, B, BN, BW, BR, BO, D, G, GP, H, HN. Ferguson (when magneto is base-mounted). Fordson Current Model, Flywheel ignition, and Battery Ignition types. International 1-4, 1-6, 1-9, McCormick-Deering W-4, W-6, Tractor T-6, T-9, T-14, Farmall A, AV, R, H, M, 10-20, ID-6, WD-6, WD-9, Tractractor TD-6, TD-9, Farmall MD. M-M G, GTA, U, UTS, UTU, GT. Massey-Harris "Red Pacemaker", 102 Junior. Other items similar to this can be found in the Motoring Collectables section of the site. Tractor-related items include a brochure/poster for Esso Green TVO and a leaflet for Dextrol Motor & Tractor Oils. Elsewhere on the site you'll find an extensive free classifieds section relating solely to vintage and classic tractor parts.